One of our regular blog reader (Peter Munn) was searching for online money making tips, he found our blog the great source of information as compared with others on the internet who do not give proper guideline to their loyal readers. He had raised very important concerns which are essentially basic to know for everyone who need to begin an online earning career on the internet. Since Online income career is so lucrative as you don’t have to bring in huge investments to get started. All you need is to create great stuff for your loyal blog / website readers or start offering them consultancy or technical trouble shooting services. A blog is such a category of website where the content is published on chronological basis. Now what does chronological refers to? The contents / posts of blog are published in a date wise sequence. In general terms blog is also referred to be a dynamic website which is running on some sort of database. I have used two blogging platforms, namely Blogger & WordPress. Blogger has a xml database while WordPress is running on SQL database. Any blog or website that involves a database is termed as dynamic, while others are static. A simple static website that is not a blog doesn’t have to have its contents organized in date wise sequence. Some people do have a mis-conception that blogs are only of personal nature, that’s not true 100%. Since you can add up many authors in a single blog or you can totally stay anonymous author, remaining an anonymous author will clear the fact that blogs aren’t necessarily to be of personal nature. A website is a directory and source of information for many people who are connected with the internet. The only difference between a regular website and the blog is that a simple & regular website doesn’t maintain its contents or posts in the chronological date wise order. You can create the contents of a website as they way you like and arrange them as per your requirement. Website can either be static or dynamic as I had explained above, a dynamic site involves database. Either blog or a website, both need to be updated with latest information as per your niche that you are working on. No one likes out-dated information that doesn’t help. So you must keep in mind that you will have to work hard and keep the site’s contents up to date. This is perhaps the most important question that arises in the mind of every person who wish to have their online presence in the form of a blog / website. How much would one has to spend to get a website running? This question depends upon the nature of site you are planning to run. As per my personal experience, I just had started with $12 for domain name registration (annually – 12 months) and used blogger’s free platform as my hosting. This is the cheapest way to get your website. Perhaps you must comply with the terms & conditions of Blogger in order to avoid any subsequent troubles. Obey the copyrights and don’t create such sort of contents which are not legal according to law & blogger’s terms. Although if you need more control over your blogging experience, you must go with WordPress self hosted, for which you are required to pay some where near $8 – $10 on monthly basis for the shared web hosting. I recommend to get started with HostGator, as they are too good for beginners. HostGator’s baby plan would help you to serve 15,000 – 20,000 hits per day with ease. But if you will exceed that much visitors on daily basis, your website / blog will become slow and you will be advised by HostGator to switch to their Virtual Private Server (VPS) plan. So the initial cost of running a blog / website will be $10 Domain Registration + $120 Web Hosting = ~$130 for an year. That’s a rough estimate. 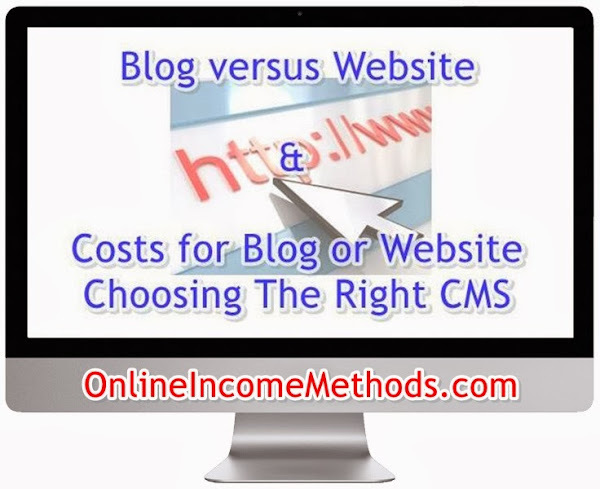 Don’t worry, this is just an investment to run your online business website / blog, if you are going to practice our online income methods on your blog / website, you will surely be earning more than $1000 every month right from your home. Content management system or dynamic website is highly preferable, since it keeps all your stuff saved on a single database. While static website needs to be manually updated on every single page. If you can handle manual updating stuff, you can simply search for Free CSS/HTML templates and edit them as per your need and get your site ready. And for dynamic sites you are not just bound to use WordPress, rather you can use your own custom content management system, developed by you. Further you can find tons of options like Joomla, PHP Nuke & VBulletin Forums to choose your CMS at HostGator. You can even host a static website or create a dynamic php & mysql based site and then host it at HostGator. With blogging CMS like blogger or wordpress you can easily focus towards the content creation while with a custom built CMS (content management system) you will have to take care of the troubleshooting stuff, this way your sole focus towards content creation would get effected. You can also easily change the whole design of your blog with thousands of high quality templates / themes available for blogger and wordpress, however with a custom CMS you will have to spend your time, energy and money for the re-design process. On the other hand if you have high traffic site CMS usually requires more web server resources, such as CPU & RAM as the pages have to be created on request basis each time a query is called towards the database, thus you might have to switch towards more expensive VPS or even dedicated web server. Since shared web hosting environment cannot bear the load of heavy traffic sites as it effects all other clients on the server. You can save yourself from this fuss, by having a static website or you will have to have a powerful web server for high traffic dynamic website that is using any CMS. ← How to Earn Money with Google Adsense in 2019?